This was first posted on June 4, 2015. I hope you enjoy revisiting this book! If you haven’t already read it, I urge you to do so. Publisher: New York: Sandpiper, 2011, 2013. Joe Pepitone once gave me his New York Yankees baseball cap. He gave it to me. To me, Doug Swieteck. To me. 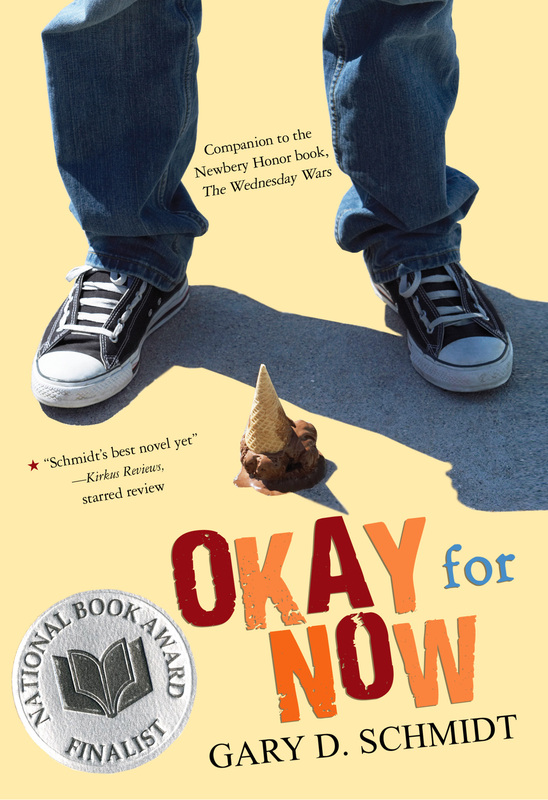 Okay for Now is a companion volume to The Wednesday Wars, which I featured on Monday. In terms of time period, it takes up where The Wednesday Wars left off, in the summer of 1968. It tells the story of Doug Swieteck, the kid who bullied Holling Hoodhood in the earlier book. In Okay for Now, Doug, his abusive father and his troublemaker brother have just moved from Long Island to upstate New York, where his father has been promised a job. Doug’s other brother is fighting in Viet Nam. Doug didn’t want to move. He’s filled with resentment and fear. He’s afraid of his father, afraid of what his brother is getting into, afraid it will be found out that he can’t read, afraid he will be tormented at his new school. The book is told in the first person. That immediately draws the reader into the story, into Doug’s person. It is the perfect way to show his attitude – his attempt to cover his fear with a veneer of hard coolness. The reader sees that there is something past that, but he only lets us into the depths of what is going on very slowly. It takes a while before we realize that he can’t read, for example. Despite his illiteracy, he is drawn to the library, where he discovers a book in a glass display case, a book filled with the amazing bird paintings of John James Audubon. Doug starts trying to copy one of the drawings, holding his hand as if it held a pencil, moving it over the glass of the case. He doesn’t realize it, but a librarian has seen him, and leaves paper and pencil for him, then begins teaching him how to draw. One day, however, the page has been turned. He has to start working on a different bird drawing. The librarian won’t say why the page has been turned. As Doug becomes more adept at drawing, and the librarian grows to trust him more, Doug learns that the library is slowly selling off the pages of this rare book. Doug’s life becomes a quest not only to find meaning for himself, but also to discover who has purchased the drawings and then get them back. This book draws the reader in (pun not intended) even when the reader feels rebuffed by Doug’s sometimes harsh attitude. The story compels the reader forward – I read it voraciously. It is a powerful book that sometimes brings hurt to the surface, sometimes joy, and always feels real. I highly recommend it. For Further Enrichment: There is an educator’s guide and a webcast on the author’s website. There is an excellent article and interview on National Public Radio’s website. Kids can learn more about Audubon by watching this video at PBS’s Thirteen and by reading this National Geographic article. There’s a lesson plan for teaching kids about the Viet Nam War here, at PBS. Here’s an article for teachers about teenage illiteracy and a website to help parents and caregivers make literacy part of everyday life. An interesting story. Going to see if the library has it. Love how it deals with a number of universal issues. Thanks for sharing. You’re welcome, Diane. I hope you enjoy the book!